The word "koi" comes from Japanese. Koi fish are specially bred in Japan for their color. A prize example can be valued in the $100,000 range. Koi are a type of carp and have been cultivated and bred in Japan for possibly thousands of years. If you have been to Japan you will notice they are a common feature in most traditional Japanese gardens. They most likely originated from Eastern Asia, Aral, Black and Caspian Seas. Earliest records of Koi have been found in China and have been widely spread in Japan. For the Japanese koi fish represent strength and power because they are often able to lift their entire body up and jump out of the water. Koi fish tattoos are beautiful and wildly popular right now. Koi fish tattoos of course have a long history and go all the way back to ancient Japanese times and it is a definite Japanese or Asian tattoo theme. Therefore the tattoos that represent koi fish often show them splashing in the water and water flying everywhere which shows of their strength. 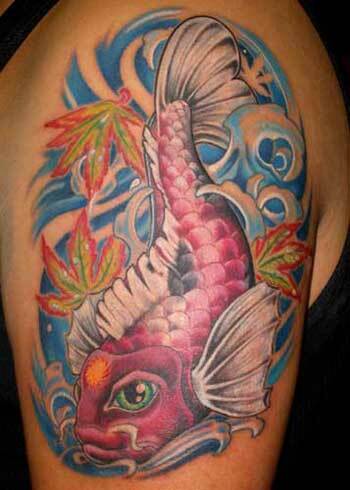 Plus as an added bonus they are an absolute beautiful fish and the colors of them lend themselves to a tattoos. The beautiful bright oranges mixed witht he blues of water make for an ideal tattoo plus since they are traditionally a Japanese tattoo they lend a sort of forgien mystery to their air. Koi Fish tattoos are now very popular among men and women. Typically men get them on their shoulders or calf and women like to get them as a lower back tattoo.There are a few out there that also get them as full back tattoos with more of a tradition Asian design. 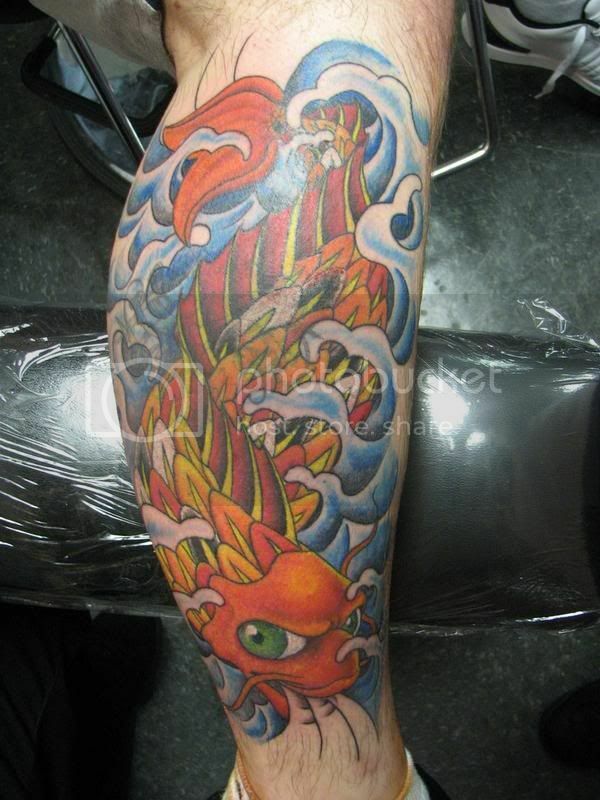 The color scheme of the Koi fish tattoo is very important element. A common color scheme would be the Yen Yang design of black and white. Most of the cases, the color scheme work the best if integrate with your shin color. For instant, if you have a dark or olive skin color it may be more suitable to choose a bright hue so the Koi fish tattoo to make it more visible. The natural colors of white, red, black, yellow or gold or perhaps a mixture of those colors would be applicable if you really want the test of more traditional style.Always remember that Koi Fish tattoo needs a place of honor on your body. Men generally get them on their shoulders or calf and women like to get them as a lower back tattoo. Additions- Along with the koi fish tattoo you can always put some water in the background that splashes around the fish. Also Cherry blossom flower are very traditional and go well with a Japanese themed tattoo. Cost-It all depends on what size, how many colors, and type you want.Additions and if you want the work custom designed or you are going to use flash. They typically run between $50 to $250 dollars. The Koi is associated with the family. On Children's Day Koi flags are raised, Black Koi the father, Orange/Red mother, Blue/White for a boy, red/pink for a girl. The Koi Fish symbolizes courage in the Buddhist Religion. According to Buddhists, humans 'swim' through the 'ocean of suffering' without fear, just like a fish swims through water. Another word to describe "love" is "koi". The kanji character for "kokoro (heart)" is included as part of both kanji characters. Both "ai" and "koi" can be translated as "love" in English.